The junk gobbles up our disk space and drags down our Linux machine. 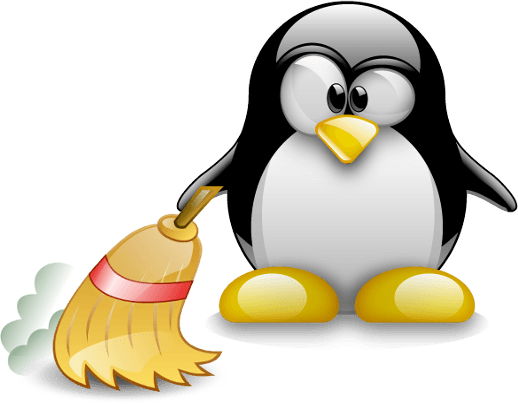 From this article you will learn how to clean up junk files and thereby speed up your Linux machine by using the terminal app. Determination of the amount of used and free space. Note: The parameter h is needed to display the data in familiar megabytes. In the command output will be information about what amount of disk space on all mounted file systems, how busy and how much more freely. Note: The program df only displays information about the mounted devices and partitions. Determination of the number and volume of the specified files and directories. The program du lets you know how much space take a particular file or directory. It is useful for determining the largest files and directories as candidates for removal in the struggle for space. The parameter m is needed to display the data in a familiar megabytes. The parameter s is necessary to show only the total volume of the catalog. If you do not use paremetr s while in the output will be data on the volume of each subdirectory and file in the specified directory. With the parameter S (with a capital letter) in the output will only information about the volume of sub-directories but not files. Cleaning the Trash folder from the console. To get rid of the files in Trash folder, you first have to locate your Trash folder. The parameter r is used to recursively remove (delete subdirectories with file attachments). The parameter f (force) is used to ignore errors related to non-existent files and for that did not request confirmation of transactions. ~/.local/share/Trash/files/ – The way in which files are deleted (garbage in the cart). A tilde and a slash (~/) short address of the home directory to use instead of /home/user/. I use a file synchronization program BitTorrentSync who has his cart along the way home/user/btsync/.SyncTrash/. All ever downloaded us packages (apt) fold on our disk in the local repository and automatically never removed. apt-get clean - Command clean is used to free up disk space by purification packets received from a local repository,in other words clears the cache apt located on the path /var/cache/apt/archives/. apt-get autoclean - It differs from the clean in that what deletes the cache those packages, that can no longer be downloaded (eg older versions of packages), and thus useless. apt-get autoremove - The command autoremove is used to automatically remove packages which were set to satisfy dependencies for other packages and now no longer needed.